Following the featured article in the Montrose Daily Press was another article with more detailed information about RMSC. We wanted to thank journalist Carole Ann McKelvey for her wonderful writing of this article and her support for this project. The Sunridge Earthship of Gerry and Dennis Weaver is currently on the market with a price tag of $1.3 million. Following the passings of the actor and environmentalist Dennis Weaver, and recently of his wife Gerry, the family has decided to sell the luxury home and property. 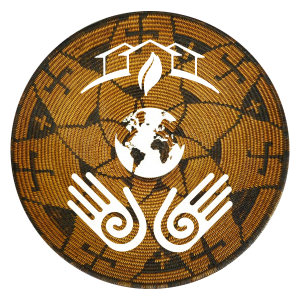 Weaver described the Earthship home in Colorado as becoming a “celebrity in its own right”. “Primarily it’s a solar/mass house,” Weaver noted in his book “All the World’s a Stage”. He said people understand the solar concept and how to use it as an energy source, but it’s the mass concept of the house he feels is more interesting. Mass in a house tends to stabilize temperature, it holds energy. “The Earthship operates on the same principal as being in a cave,” Weaver explains, “where the air is cooler in the summer and warmer in the winter due to the surrounding mass.” It’s the same as how the Earthship he created, but by using automobile tires (250,000 of which are thrown away a year in the US). The Weavers named their green-built, energy-efficient SW CO. home, ‘Earthship’ and the property “Sunridge”, because it takes advantage of the area’s natural solar. An antique doorway leads to an tiled entry and the upper level of the home and a vista that is designed to envelope one in warmth, space, and peace. Looking south, through the full glass windows, one can see across the meadows, pond, and creek toward Pleasant Valley, Ralph Lauren’s ranch and the Sneffels Range. 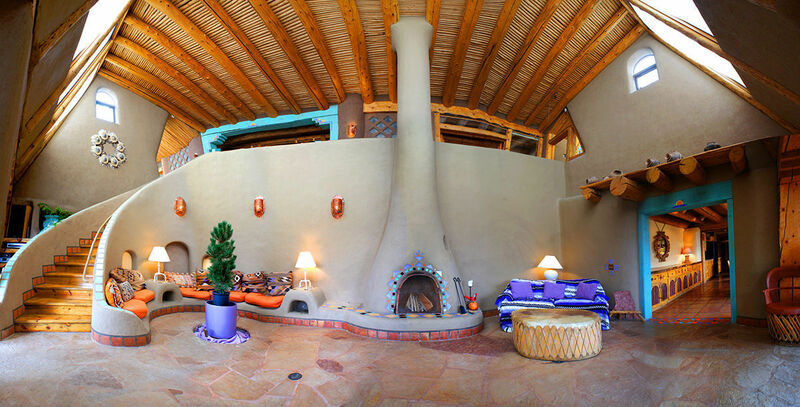 To either side are guest rooms, each a U-shape to hold in heat through “mass”, and each with a kiva style fireplace, custom adobe headboards on the wall and private baths. At each end of this top level are an expansive master suite and the library, which can also be used as a media room. In the master suite one finds a large master bath, rocked jacuzzi corner tub with waterfall, walk-in shower with glass walls and mountains outside, and a private walkout deck. The library features a sculpted tree, created by Dennis Weaver himself. In building the home the dirt was rammed into the tires to produce density – the greater the density, the greater the mass; each tire bulged with the more than 3 wheel barrels of dirt rammed into them by sledgehammer. Weaver called them “tire bricks” and when each was filled it weighed close to 400 pounds. Then the tire bricks were laid in courses, like regular bricks, to form the walls of the house inside and out. This surrounded every living space in the house with a huge amount of mass. The home needs no air-conditioning or heating ducts, although there are backup energy sources. Weaver said walking into the house feels like walking into nature, plants love it. It was one of his and Gerry’s goals, to grew organic vegetables year-round in south facing planters – tomatoes, peppers, lettuce, chard, cucumbers and spinach, and geraniums. The temperature in the house ranges, from it’s coldest at 58 degrees to 78 degrees, no matter how cold or hot it is outside. Weaver said one just needed a sweatshirt in the morning and by the time the sun hit the house it warmed up comfortably. A team of sustainable living advocates are attempting to purchase the Sunridge EcoRanch.Their plan is to give the epic “Earthship”‟ home and land its second stage of evolution. The Rocky Mountain Sustainability Center and community members have set a goal to raise funds for the property, just outside of Ridgway, with an eye toward eventually placing it into a Community Land Trust. The community group is building its advisory board with members who have been long-time sustainable living advocates and national leaders in the movement. The group’s first task will be to raise the $1.3+ million to purchase the home and property. Fundraising efforts are currently underway. Project Director Darlene Cavallara is spearheading the acquisition campaign and plans to establish the Rocky Mountain Sustainability Center (RMSC) and a “Low Impact Sustainable Development” agency on the site. The vision sees Sunridge being the headquarters and offering educational classes on sustainable living technologies, systems and structures. The late Dennis Weaver and his wife Gerry built the iconic home in 1990, which was designed by alternative builder and architect Michael Reynolds of Earthship Biotecture in Taos, New Mexico. It is built from recycled materials such as rammed earth tires, mud, aluminum cans and beetle kill lumber. It was Weaver’s desire that his home be living proof to everyone that a large luxury home can be built beneficially into the landscape and made from recycled materials to help save the planet’s resources and environment. The year 2015 marked its 25th anniversary. The RMSC agency also has as its goal establishing new zoning rules and building codes in the United States, based on criteria established in 2008 in Wales. “It is crucial at this time to have new zoning and codes for sustainable community development in the United States to offset the negative effects of global warming and give local governments the ability to work with a community agency that will offset the fiscal burden of oversight and development,” said Cavallara. Besides an education center, the group will also be demonstrating the use of both old and new technologies that allow human beings to have a positive lasting impact on their environment. For more information contact Cavallara at director@rockymountainsustainabilitycenter.org.